The Red tail shark is a member of the genus Epalzeorhynchos in the minnow and carp family Cyprinidae. The scientific name for the red tail shark used to be Labeo bicolor, but it has today been changed to Epalzeorhynchos bicolor (commonly misspelled as Epalzeorhynchus bicolor). Just like many other popular aquarium fishes with “shark” in their common name, the Red tail shark is not really as shark. Common names for this fish include Redtail sharkminnow, Redtail black shark, Red-tailed labeo and Redtailed shark. The Red tail shark is very popular in freshwater tropical aquariums. It is very beautiful with a vibrantly red tail that contrasts against a pitch black body. The intensity of the coloration can indicate how well your Red tail shark is doing in the aquarium, since a diseased or stressed Red tail shark often develop a more dull and listless coloration. If you care for your Red tail shark, it can live up to 15 years. 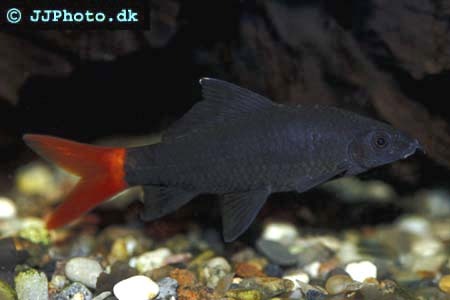 The Red tail shark is popular in Asian biotope aquariums as well as traditional community tanks. It is very territorial and keeping several Red tail sharks in the same aquarium will usually result in a lot of fighting. It can also be aggressive towards other species, especially if those species look similar to the Red tail shark. Keeping it with robust fishes that will not tolerate being bullied is therefore recommended. Keeping your Red tail shark with other fish from the same genus is generally a bad idea, and the Siamese Algae Eater and Red-Finned shark should also be avoided. Young specimens are usually more peaceful than older fishes. The Red tail shark has been successfully kept with big Tetras, Barbs and many other types of sturdy fish species. The Red tail shark can grow up to 12 centimeters and should not be kept in an aquarium that is smaller than 90 centimeters (3 feet). A well decorated aquarium with plenty of plants and rocks will be appreciated since it resembles its native home in Thailand. Bogwood and artificial aquarium decoration can also be used to provide hiding places. The Red tail shark should be kept in a closed aquarium, since it might otherwise jump out and die. Since the Red tail shark is native to the tropics, the water temperature in the aquarium should be kept in the 22-26 C (72-79 F) range. The water should be rather soft and the pH 6.5 to 7.0. Slightly acidic water is better than neutral, but neutral water will be tolerated. The Red tail shark is an omnivorous species that will eat worms, insects, crustaceans and plant matter in the wild. Combining meaty food with some vegetables, algae or plant matter is therefore necessary. Most specimens will eat live food as well as flakes and pellets. Since it is a bottom feeder with an under-turned mouth, pellets are more suitable than flakes. Breeding the Red tail shark in aquariums can be hard, and the Red tail sharks in fish stores have therefore usually been imported from Thailand. In Thailand, large amounts of Red tail sharks are produced in fish farms each year. Only occasional reports of Red tail shark spawnings in aquariums exist. One of the problems that must be overcome if you want to breed Red tail sharks is the fact that they are very aggressive. Keeping more than one Red tail shark in the same aquarium will usually result in a lot of violence, and this is naturally a problem if you intend to breed them. Sexing is also difficult. Females may have a less pointed dorsal fin. The Red tail shark is endemic to Thailand, but it might already be extinct in the wild. Since it is so popular in the aquarium trade, it is however produced in aquacultures and tens of thousands of Red tail sharks are exported from Thailand each year. Scientists are still not certain about the current wild status of the Red tail shark, or even why the wild population decreased so dramatically. Many people believe that the Red tail sharks popularity among aquarists led to over fishing, but there is actually no proof to support this theory. According to the IUCN Red List of Threatened Species, habitat modification is a more probable reason behind the sudden decline of the wild Red tail shark population. The many dams that were created in Thailand during the 1970’s affected the natural habitats of the Red tail shark. The freshwater basins were you use to be able to find Red tail shark was seriously impacted by the dams. A lot of quagmires and swampy environments in Thailand have also been drained during the last decades. The Red Tail shark should be able to withstand even heavy harvesting, since it has a minimum population doubling time below 15 months. During the 1970’s, this fish was introduced to the Philippine waters, but we do not know whether or not there exists an established Red Tail shark population in this country today. Occasional specimens have also been found in the Mekong River. When the Red tail shark was still commonly found in Thailand, it inhabited the Chao Phraya basin. It lived in permanent rivers, streams and creeks in the Chao Phraya wetlands. Since the native habitat of the Red tail shark is fast-flowing streams, it will appreciate a strong water current in the aquarium. The Red Tail shark is a bottom living species, but very little is known about its wild habits and habitat since it has not been found in the wild for so long. Chao Phraya is one of the largest rivers in Thailand and it runs from the central plains in the north and all the way to Bangkok and the Gulf of Thailand in the south. Chao Phraya is 370 kilometers long and the Chao Phraya system is responsible for draining a 160,000 km&sup2; large region. The Chao Phraya River has always been extremely important for the region, and major cities like Bangkok, Singburi and Ang Thong can be found along the river. In older maps, it is simply referred to as “The River” in Thai (Mae Nam or Menam).